Speaker of the House of Representatives, Hon. 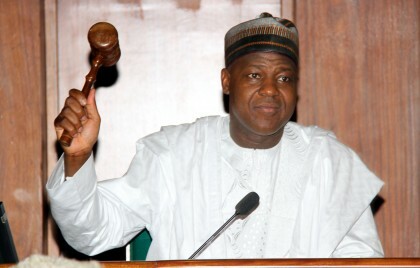 Yakubu Dogara, has said that the Eight House of Representatives has passed a record number of bills and motions. Hon Dogara, stated that the achievement was made possible through the contributions and cooperation of all members of the House, and thanked them for their unwavering support for his leadership. Speaking at a short ceremony of handing over to him the New Telegraph Newspapers’ Award for Public Service in 2017, which had been collected on his behalf by the House Majority Leader, Femi Gbajabiamila, the Speaker noted that Nigerians will celebrate the 8th Assembly after the expiration of their tenure in 2019 as more bills would be passed in 2018. The Speaker also revealed that the House will continue to celebrate Nigerians who excell in various spheres of human life saying, “we have broken the glass ceiling in different areas of calling. We made a promise that any Nigerian that excels or sets a good record, the National Assembly – in particular, the House of Representatives – will celebrate that person. Today we celebrated 2 young people who have lived and set records in their fields and they are living testimonies to the Nigerian youth that whatever is their dream, it is achievable, and I pray that – as I said in the Chambers today – the recognition given to them on the floor of the House will spur them to greater achievements in life”, he said, referring to Aarinola Olaiya Blessing and Abdulsalam Kamaldeen, who were honoured for exceptional academic excellence during Tuesday’s sitting. The Speaker further called on legislators to sustain their efforts and congratulated other 2017 NEW TELEGRAPH NEWSPAPER awardees. Gbajabiamila, on his part, said being chosen to represent the Speaker was an honour and that the award had made all Members extremely proud.